To use the Game support, you must enable the Game Player. The Game Player adds support for all the above game systems to a Media Director at once, and you must enable the Game Player on each Media Director you wish to be able to play games. Find the media director on which you wish to enable Game Support. Find the Game Player. Select it by checking its box. Watch your nearest orbiter for messages. You should see installation messages. When the Orbiter re-appears, it will ask you to regenerate orbiters. Regenerate all orbiters in the house. The Wizard > Media Directors Page provides everything you need to adjust the operation of each media director in the house. For each system you wish to be able to play games, you need to do these instructions. 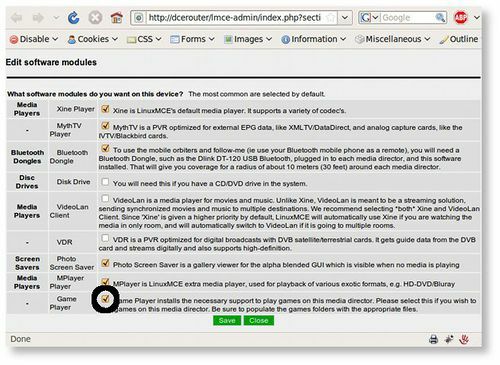 The Software Modules page allows you to select software that can easily be installed into LinuxMCE To be installed onto each media director. We want to select the Game Player. If you wish to uninstall the Game Player at a later time for this media director, simply uncheck the box, and press Save. Your Orbiter should emit many messages relating to the installation of the software. If this is the first media director you are installing onto, the Core will also need to install the Game PlugIn so that it can manage the different Game Player instances throughout the house. The installation of the Game PlugIn also installs data packages which provide metadata and images for game ROMs to make the automatic game cataloguing process possible. This process of installing the Game PlugIn the first time can take a long time. Please Be Patient. Subsequent installations do not take as much time. We will improve this installation time significantly in future releases. Once the installation process is complete, the system will ask you to reload the router. You must do this so the system can use the Game Player. Press Quick Reload Router This process should take approximately 15 seconds. Once your router is reloaded, and the system finds the new Game Player running, it will ask to regenerate all your orbiters in the house so that the Games button will be visible. This process should take approximately 2 minutes, per Orbiter on average. Once the Game PlugIn has been installed, you will then need to install some games, as there are no games included by default. Here are some freely available games: http://mamedev.org/roms You can install them by copying them onto the Core, or any storage device that uses LinuxMCE Folder Structure. The Following example assumes you are copying the ROMs directly onto the Core. Find the target game system. Copy the ROMs to this location. Using Network Places on Windows, or Connect to Server on Mac or Linux, open a network connection to your Core, select the Public share. You can also select the user shares if you wish to keep ROMs private to a single member of the house, Games stored in this manner can only be accessed by entering the user's PIN number after selecting the user's name in the Media Browser. Once you've opened the Public, or User folder, Select the Games folder. * The systems in bold _require_ a MESS BIOS rom zip the same name as the folder to be placed inside the directory. Drag over the ROMs from your source media to this target folder. After 60 seconds, LinuxMCE will have detected the new ROMs, and attempted to tag them. If LinuxMCE can tag them, then it will attach descriptive attributes such as Title, Manufacturer, and Year, and attempt to find and attach a picture of the Box or Cartridge artwork. Right now, metadata is only parsed for MAME games. It is a simple TOSEC parser in place for appropriately named ROMs, but it doesn't deal with every known variation of TOSEC or the GoodSet, etc. If you find box or cartridge artwork for a game that we do not have, we would very much appreciate it if you would send it to one of the developers so that it may be included in the metadata package. Playing Games in LinuxMCE is simple. You merely need to select the Games scenario from the Media Scenarios. The Games scenario will be available in any room with a media director that has the Game Player installed. then play the game with your desired gaming device. Once a Game has been selected, and the Play button has been pressed, the emulator should start and present the selected game. Because each game system works differently and was interacted with diferently, LinuxMCE provides different Orbiter screens so that you can accurately interact with the emulated version of the game system. Some buttons are also common to all game systems, and some are specific to each game system emulated. For non on screen orbiters, you will see the remote appear in the same manner as the videos and music remotes, with all functions visible. Under UI2, tapping the Menu key will show the same functions as described above in the left most "Now Playing" menu. Power/Off - This button, like all other media types, will cause the game to stop, and will return you to the main menu. Thumbnail - Allows you to take a picture of the screen, to assign to an attrbute, such as the game title. This picture will then show up in the File Browser. Bookmarks - Allows you to save bookmarks on games and systems that support them. Not all game systems support Bookmarks, and due to the way MAME and MESS work, we can't tell you ahead of time which ones will and wont. Bookmark support is added per system driver and can change as newer versions of MAME and MESS appear. View Attributes - Allows you to see the attributes of the currently playing game, including the attached artwork. P1 - Tells the system that 1 player is to play. Other Player buttons include P2, P3, and P4, which say 2, 3, and 4 players respectively. Which of these buttons are available on which system varies, and can be called Start instead. Pause - Pauses the game. The screen will darken when the game is paused, to serve as a visual cue. Reset - Resets the game or game system. Monitor Mode - Toggle. Broadcasts animated images of the playing game to all orbiters in the room. This can be used, for example, to watch the game from somewhere else in the house. No audio is broadcast. Animation will be slower than real time. You can use any HID based joystick or gamepad, including the X-Arcade tankstick. You can also use the Stelladaptor for Atari 2600 controllers attached for Atari 2600 games. 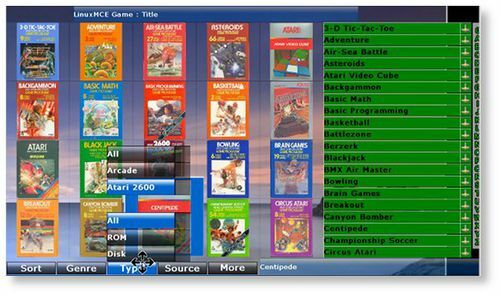 There is still much left to do, with regards to playing games on LinuxMCE, such as supporting vintage computer systems, in addition to the game consoles, consolidating various bits of media and metadata to make viewing the various game media in the library a more pleasurable experience. The Game Player TODO keeps a current list of upcoming changes. Important Legal Notice: Obtaining ROM images of games you do not own is illegal in many countries, including the United States of America and countries in the European Union. 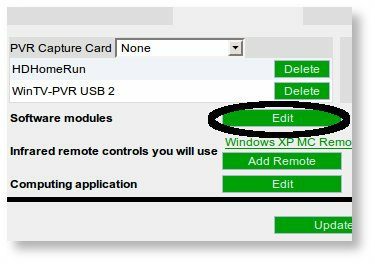 LinuxMCE does not provide ROM images, nor does it provide, or facilitate the means by which to get ROM images that are still under copyright. This page was last modified on 25 May 2013, at 17:23. This page has been accessed 36,297 times.